Star Trek Red Alert slot machine is another title from WMS slots that started life in the land-based casinos of Las Vegas, and since moving to the world of mobile casinos has grown in popularity even further. It uses a standard video slot layout of 5 reels and 25 paylines, and has a modest jackpot of 1,500 but where the game really stands out is with its unlimited free spins bonus, which if you get lucky can result in life changing wins. For all the details check out the full Star Trek Red Alert slot review below. Get ready to explore new galaxies with the original crew of the Starship Enterprise in WMS’ officially-licensed Star Trek Red Alert slot – the first of five slots based on the iconic science fiction series. Featuring all your favourite characters on the reels played and voiced by the likes of William Shatner, Leonard Nimoy and James Doohan, the game provides an authentic video slot experience for all you Trekkies out there and is also packed to bursting with random bonus features and collectible medals. 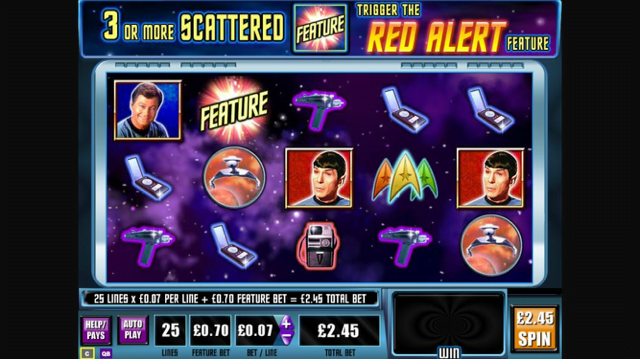 Playable from as little as £0.35 per spin, the Star Trek Red Alert slot machine is available across all desktop, mobile and tablet devices and features five reels and 25 fixed paylines. Not only that, but the slot also includes in-built memory that sees it save your progress at the end of each session, with players able to return at their current Starfleet rank the next time they play in order to unlock further episodes. During the base game in Star Trek Red Alert, players will be able to benefit from one of four randomly triggered bonuses whenever a winning spin occurs. These include Scotty’s Wild which turns one or two reels completely wild, Spock’s Multiplier which issues a random 3-10x prize boost, Rock Wild which sees a rock creature dump a multiplier wild onto the reels and finally Enterprise Fly-By, which changes all symbols featured in your winning combo into higher value character icons. Each of these bonuses comes with a short video clip and some original audio, but the real meat of the game lies in the form of the Red Alert feature. Triggered whenever three or more feature symbols appear anywhere on the reels, players will be transported to a new gameboard where they’ll receive an unlimited number of free spins so long as they continue to land winning paylines. For every win they collect, they’ll open fire on an enemy fleet and receive a random multiplier, but for every non-winning spin the Enterprise will lose one shield unit. The feature ends when the Enterprise’s shields have been completely depleted, with players then having to select one of two communication channels to reveal a full shield re-charge, a “spin till you win” bonus or game over. An immersive video slot experience that is certain to appeal to fans of the series and feature-hunters alike, the Star Trek Red Alert slot is a highly rewarding game that provides plenty of depth and excitement. Like the Star Trek Red Alert slot review? Check out these as well…..